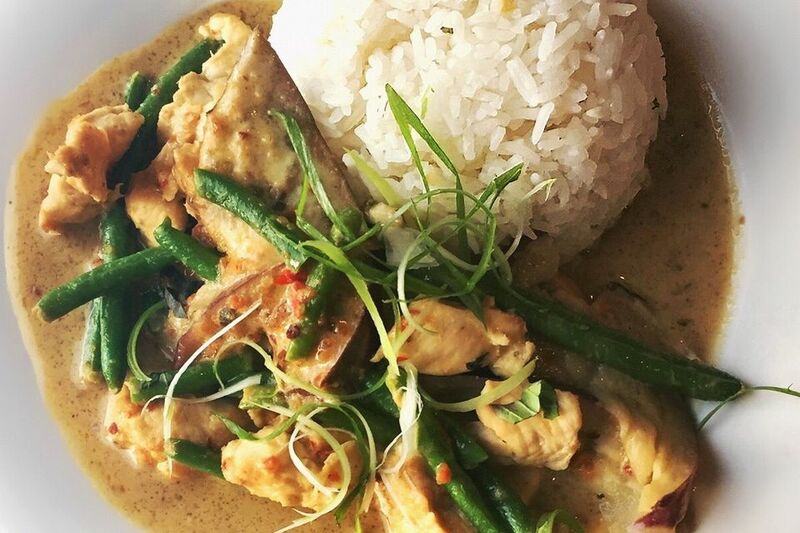 This wonderful-tasting Thai coconut curry chicken is quick & easy to make with the substitution of lime or lemon juice for lemongrass, cutting the prep time in half. Don't be put off by the long ingredients list - this is simply because I prefer to make my own paste from scratch rather than using store-bought curry pastes, making for a fresher, superior-tasting curry. This recipe includes potatoes, a common ingredient in street curries, but other vegetables can be added as well according to your preference (zucchini and green beans are two good ones). Place all curry paste ingredients in your food processor or blender. Add 3 to 4 tablespoons of the coconut milk to help blend ingredients and blitz to create a fragrant Thai curry paste. Heat a wok or deep frying pan over medium-high heat. Drizzle in the oil and swirl around, then add the curry paste. Stir-fry 1 minute to release the fragrance. Then add the chicken pieces and turn pieces to coat. Then add the stock and remaining coconut milk. Next add the potatoes, lime leaves or bay leaves, and whole cumin seed. Stir and bring to a gentle boil. Cover and reduce heat to medium-low, gently simmering 15 minutes. Stir occasionally. Add the tomatoes and stir. Then continue cooking another 15 minutes, or until chicken has achieved desired tenderness. While curry is cooking, prepare the topping. Place shredded coconut in a dry frying pan over medium-high heat. Stir until coconut turns light golden brown. Transfer to a bowl and set aside to cool. When chicken and potatoes are tender, remove from heat. Add 3/4 of the toasted coconut and stir in. Taste the curry, adding more fish sauce for more salt/flavor. If you find it too salty or sweet, add more lime or lemon juice. Add more chili for more intense spiciness. Portion out curry into bowls or plates. Top each one with fresh basil and a generous sprinkling of the toasted coconut. Serve with plenty of steamed jasmine rice on the side. For a thicker curry sauce, use a cup to measure 2 teaspoons of cornstarch into 3 to 4 tablespoons cool water, stirring to dissolve. Pour this into the hot (finished) curry while stirring over medium heat until sauce thickens.